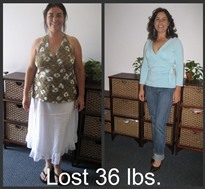 “I joined Healthy Inspirations in February 2009. I wish I had joined earlier! I talked with Linda Lex, the owner of Healthy Inspirations, about joining in November 2008, but thought I would wait until after the holidays. Losing weight over the holidays would be too difficult. I should have just joined right away—their program is wonderful. Healthy Inspirations provided me with easy to follow eating plans (without having to purchase their food), terrific one-on-one support and great educational materials to assist with my healthy lifestyle changes. I have taken off 25 pounds. I have not been this size since before my 5 year-old daughter was born. I thought that I had just gotten bigger over time and would never again be a size 8. I am now 15 pounds less than I was when I first became pregnant 6 years ago." “I have been a fairly regular exerciser for years, but continued to slowly gain weight as I became older. I would also take off 10 pounds and then put them back on. I thought that I had pretty healthy eating habits. My husband is a chef and I thought I would never be able to lose weight with all the delicious food he makes, but I have learned better portion control and food choices through the Healthy Inspirations program. Minor health problems that I had attributed to getting older, back and foot pain have completely disappeared. I feel great and have tremendous energy, too. Working out at Healthy Inspirations is fun. I have made new friends and each visit is like going to a party. Who knew that weight loss could be this fun? I recommend their program to anyone who wants to improve their overall health and well-being.” -Jackie Y. “Jim and I began the Healthy Inspirations journey through a local TV station contest. My desire to be at a better and healthy weight was inspired by the fact that my daughter was to be married in 3 months. Linda Lex, owner and operator of Healthy Inspirations of San Luis Obispo, was our one-on-one coach, helping us with our diet. Jim and I had gained a lot of weight during our 5 years together so I felt this would give us an opportunity to lose weight together. We needed to learn how to make better food and eating choices together. 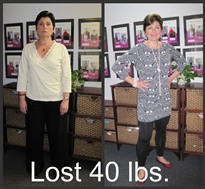 Linda provided us with motivation, enthusiasm and information we needed to begin our weight loss program. And boy did the pounds start falling off from the very beginning during the “quick start” weekend. I lost 9 pounds that first weekend and Jim lost 7 pounds. We never looked back after that, loosing a total of 81 pounds between us in 3 short months. I went down 3 dress sizes and Jim had to buy new suits and pants otherwise he would have lost his shorts around his knees. Linda and Healthy Inspirations was the hub of the weight loss wheel for us. Thank you Linda for all you do. We are different (sized) people because of you!” - Pam H.
“I was at a point in my life where nothing felt good. I would indulge myself with too much food, drink and other unhealthy pleasures completely unconscious of how it was affecting me physically and emotionally. To add to this excessive behavior I decided to take a trip at the last minute, a trip I really could not afford, but one I felt I deserved. As tourists often do, the group of people I traveled with excitedly took photographs of us on our various adventures together. I was repeatedly reluctant to be included in the group shots halfway knowing I would look as unattractive as I felt. A picture of myself would show me too much of the truth. Shortly after arriving back home these photographs found their way into my hands and just as I had expected I was now faced with the truth. I was aghast at how heavy I had become! I knew then something had to be done. I felt I needed support and guidance, so I searched for an answer. I remembered a place I had been to for a facial appointment. There were weight machines there and my ethetician introduced me to the ladies who were members of the program. I left as quickly as I could, but now I was ready to find out more. I decided to go straight there. I walked in and was greeted by the owner, Linda Lex, who patiently listened to me and offered me some great advice and gave me information about the program. I became a member that day, my goal being to not only look better on the outside but feel better on the inside! She was truly an inspiration. Today I have lost 36 pounds and I feel like a brand new woman. I try to come at least three times a week for exercise, to share my thoughts and struggles with the other members and meet with Linda to keep track of my weight loss. At Healthy Inspirations I get the support I need to reach my goal! I’m learning how to live healthy and I feel better about my life. Thank you Healthy Inspirations for inspiring me to live my life to its full potential!” -Jennifer M.
“I’m too busy.” -- Leah is a teacher and teaches at TWO schools, one for 6 hours a day and one for 3 hours a day. She has two children, a 3 year old and a 1 ½ year old. They are active and she participates in their events and fund raisers for their schools. Leah also mentors Jr. College students, is active in her church, and sells Mary Kay. Leah comes to Healthy Inspirations at least 3 times a week and more if she can possibly fit it in. “I can’t spend the money on myself.” -- Leah’s husband’s hours have been cut back, their van broke down, and the kid’s needs are always there. Leah feels that coming to Healthy Inspirations is the best investment she can make to help her manage the stress and give her best to her family. You will always see a smile on Leah’s face. “I have a family to cook for.” -- Leah stays on her nutrition plan and finds that it works even if you are cooking for a family. Her children love fruit and like to share the Protein bars. Leah has reached her goal weight and is still working out, keeping her weight off, and managing her challenging life with support from Healthy Inspirations. Leah says, “There are no excuses. Just Do It!” -Leah W.
“Before I came to Healthy Inspirations, I tried to lose weight on my own. I ate healthy and even cut out a few things that I know were high in fat. But, just couldn’t lose the weight. I had driven past Healthy Inspirations and wondered what would be different about it than other diet plans. I already ate healthy so what would be different. After putting it off for a couple months, I finally decided to check it out. I was greeted by Linda Lex, the owner, and I was amazed at what she explained about the plan. I knew it would work for me and I could obtain my goal of a 35 pound weight loss. Coming in three times a week for the one-on-one coaching and the exercising has been a great benefit. The atmosphere that Linda has created makes coming to Healthy Inspirations a special and very important part of my day.” -Julie W.
“I have lost a total of 40 lbs. over the last year and I have kept it off. I have learned the tools to control what and how much I eat and not be hungry. I like how I look and I like how I feel. I feel good about myself and my choices. I particularly feel good about my choice to join Healthy Inspirations. I wish I had done it sooner, but I’m glad I didn’t let another year go by.” -Elisa L.
Can I inspire you? I want to. I started with Healthy Inspirations in January 2009. Knowing it was going to be a long haul, but however long it took, I was going to keep plugging along and just do it. It’s not a diet. It’s a lifestyle, and I can make that statement 101.5 pounds later. Late in 2008, I really started thinking about the different ways I’d lost weight before, but gained it back plus more, so I blamed this plan or that plan. They didn’t work. If everything I did on those occasions didn’t work, then maybe I should try something different – like a sound nutritional diet and exercising. But wait, I don’t like to sweat. I changed my mind. I did some things that I had never done before. I started eating mindfully. I used to just eat whatever, whenever, not any more. I got support, too. I started sharing my weight loss experience with family, friends, and anyone who noticed something was different about me. If you think you’ll never be able to do this, just try it. Change your mind and say to yourself, I can do this. I started exercising, at first 3 times a week. Now I exercise 5 to 6 times a week. Most of us want the loss of weight right now; you have to know that just doesn’t happen. Change your mind. Don’t take so much interest in how fast it will work, moreover, how it will transform your life. I got a lot of good advice from some very knowledgeable and wise ladies at Healthy Inspirations. It’s taken some discipline too, learning new things and feeling good about right decisions. “It all started with a New Year Eve’s resolution to lose weight. That year I was going to find a way other then surgery or the prepared food diets. None of that would work for me. I wanted something that would teach me how to keep the weight off. I began seeing the TV commercials for Healthy Inspirations. They got me to thinking; this just might be what I was looking for. I went to the web site and then I got up the nerve to call. After talking to Linda on the phone, I thought about it for awhile and then called back and set up an appointment for a free consultation. It was what I had been looking for. Linda was very informative and answered all my questions. She was very understanding and eager to help in anyway she could. At no time did Linda make me feel uncomfortable. She was so supportive and willing to do what ever she could to get me started. When I left that day I had started on my long road to losing my weight. I am writing to express my deep gratitude to you and Healthy Inspirations. Seven months ago I made a decision to take action on my weight and my health. As I will be 70 years old on my next birthday, I realized that there was no better time than now to change some bad habits that I had been indulging in...overeating and sugar craving. I have several friends who were successful with your program and that was an incentive for me. I am thrilled to say that I have now lost 25 lbs! At my yearly physical yesterday my doctor was very impressed. Because of this weight loss, he has taken me off most medications and all of my test results were great! I said, "That's pretty good for a 70 year old" and he said," that's good for a 20 year old"! I started to cry...tears of joy. So, thank you, Linda. You have been so enthusiastic, supportive, knowledgeable, inspiring and delightful during this journey. The HI plan is simple to follow, sensible and healthy. It was pretty easy for me to follow it. I especially liked that I couldn't "cheat" on it and sneak in some sugary treats to sabotage my progress, because there no room for that on the plan! So perfect for someone like me. I also very much appreciate that real, healthy food is emphasized as I prefer that to packaged and processed food. I also love that I have a place to continue this program to maintain my life style change. The exercise component of the HI program is also terrific. “As I approached my 60th birthday, I realized that I weighed more than at any time ever before in my life. I don’t know why most of the things we lose we never find again, but weight doesn’t seem to be one of those things. So I made a resolution to lose some weight. I am a take charge, do it myself gal. I know the value of maintaining a healthy weight and making healthy food choices. I have lost weight quite successfully in the past (despite my fondness for cookies and that my husband is a foodie and phenomenal cook). However, losing weight this time just didn’t seem to happen. No matter how much I read about smart eating, no matter how smart I was (I thought) about my eating, no matter what changes I made or what I did, my 61st birthday arrived and I had not lost any weight. I was frustrated and DONE with not losing weight. I knew I was going to need help. I met Linda right before my 60th birthday at a business event when I was still of the opinion that I did not need her help to attain my weight goal. Right before my 61st birthday she called me again and this time I returned her call. I explained to her that I had survived Polio at age 1 year and have significant limitations on what exercises I can do. I shared with her that my weight was causing my arms to ache so badly that at night after doing only a little walking or shopping, I had trouble getting to sleep. I met with Linda and she said she could and would help me lose the weight. I wanted a steady, slow weight loss with strength training. I wanted something that was going to be sustainable. I wanted to lose the weight and maintain a healthy weight permanently. Linda tailored her program to meet my needs and preferences. We identified what exercises I could do and she created a plan that would integrate with my busy schedule. I set a goal of 30 pounds and I am now within less than 2 pounds of that goal. I have gotten all of the usual “promised” benefits of weight loss. Yes, I got an increase in energy. Yes, I feel better than I did before. Yes, my clothes fit better. (I did have to buy quite a few new things as most of what I had is now too big.) I also got the benefit of being able to go shopping (3 hours with my daughter last weekend) without being in sleep-robbing pain. But I also got an unexpected benefit - while not exactly one I discuss freely. One surprising result of my new and improved eating habits is that I no longer have chronic diarrhea. I had my gall bladder removed when I was 32 and have had this condition since. I was told it was “normal” so just dealt with it. Guess what? It is not normal. I had always noticed that when I ate sweets, it was worse. Now with the significant reductions of sugars and processed foods from my diet, I no longer suffer at all from this condition. 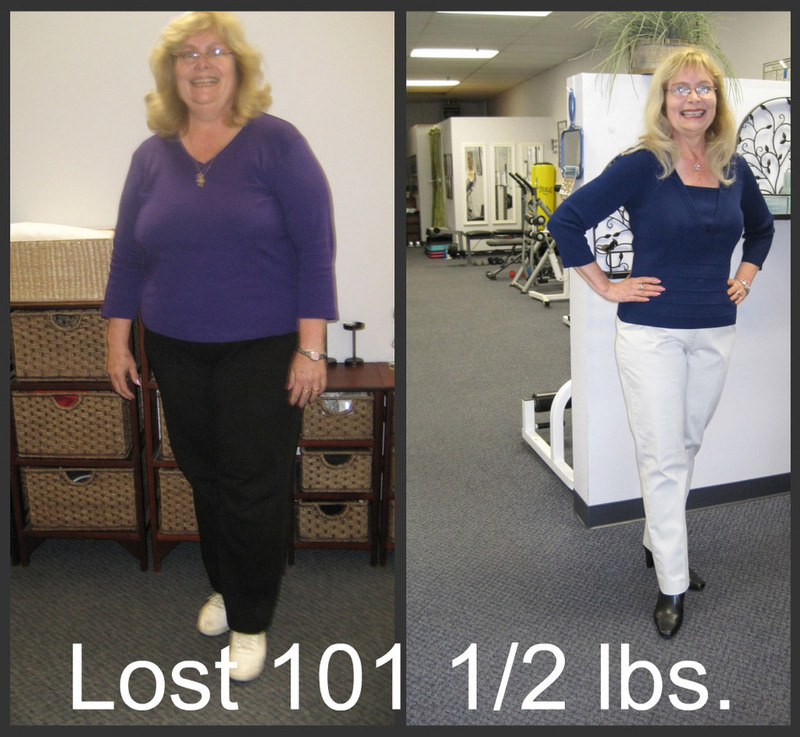 “Linda, I tried every diet, pill, and supplement during the 15 years of being overweight. Nothing worked for me. Having you teach me how to eat the right food in the right amount, at the right time has changed my life, my health and my self esteem. Having you as an accountability partner, with your sound advice kept me on track. thank God for bringing your knowledge and experience into my life. You helped make my dream come true. God bless you.” -Kat E.